JSS Diecast Software: JuDee's Collectibles. View models manufactured byJuDee's Collectibles. Our library is a reference of models produced by this manufacturer. 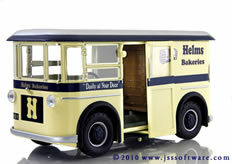 If you grew up in Southern California from 1931 to 1969, then you may remember the wonderful Helms Bakery Trucks cruising down your street, tooting it's cheery whistle. The Helmsman would park his bright blue and yellow truck to reveal drawers of warm, freshly baked treats. Pies, cakes, breads, eclairs and those legendary doughnuts... the sweet aroma attracting everyone in the neighborhood. Those days are long gone, but many native Angelinos remember the Helms Bakery Truck. Do YOU remember? If so. you'll enjoy this collectible as a momento of yesteryear, recalling the delicious baked goodies and the Helmsman's smile as he blew his familiar whistle... TOOT TOOT!